In December 2015, member states of the United Nations Framework Convention on Climate Change (UNFCCC) adopted the Paris Agreement, which aims to hold the increase in the global average temperature to below 2°C and to pursue efforts to limit the temperature increase to 1.5°C. The Paris Agreement requires that anthropogenic greenhouse gas emission sources and sinks are balanced by the second half of this century. Because some nonzero sources are unavoidable, this leads to the abstract concept of “negative emissions”, the removal of carbon dioxide (CO2 ) from the atmosphere through technical means. The Integrated Assessment Models (IAMs) informing policy-makers assume the large-scale use of negative-emission technologies. If we rely on these and they are not deployed or are unsuccessful at removing CO2 from the atmosphere at the levels assumed, society will be locked into a high-temperature pathway. To understand the implications of the Paris Agreement for mitigation policy, we must translate its qualitative temperature limits into quantitative carbon budgets, specifying how much CO2 can be emitted across the remainder of the century to keep warming below a given temperature level (1). Uncertainties in the climate system mean that such budgets are specified with quantitative likelihoods. Borrowing from the taxonomy of likelihoods used by the Intergovernmental Panel on Climate Change (IPCC), the most generous interpretation of the Paris Agreement’s requirement to keep the temperature rise well below 2°C is, at least, a likely (66 to 100%) chance of not exceeding 2°C. The IPCC has assessed 900 mitigation scenarios from about 30 IAMs (2). Of these, 76 scenarios from five IAMs had sufficient data to estimate the carbon budget for a likely chance of not exceeding 2°C. These scenarios give a carbon budget of between 600 and 1200 billion metric tons (Gt) CO 2 (10 to 90% range) for the period from 2016 until the peak in temperature [updated from (1)]. Increasing the likelihood of keeping temperatures below 2°C (or shifting the ceiling to 1.5°C) will reduce still further the available carbon budget (3). The budget is also subject to a reduction each year, currently around 40 Gt CO 2 , due to continued fossil fuel, industry, and land-use change emissions. It is important to keep in mind that despite their intuitive appeal, the complexity of carbon budgets make it impossible to assign a specific budget to a given temperature rise. Because the carbon budgets represent cumulative emissions, different emission pathways can be consistent with a given budget. Using the 76 scenarios consistent with a likely chance of not exceeding 2°C (see the figure), two key features are immediately striking. First, the scenarios assume that the large-scale rollout of negative-emission technologies is technically, economically, and socially viable (2, 4). In many scenarios, the level of negative emissions is comparable in size with the remaining carbon budget (see the figure) and is sufficient to bring global emissions to at least net zero in the second half of the century. Second, there is a large and growing deviation between actual emission trends and emission scenarios. The sum of the national emission pledges submitted to the Paris negotiations (COP21) lead to an increase in emissions, at least until 2030. They thus broaden the division between pathways consistent with the temperature goals of the Paris Agreement (5) and require either much more severe near-term mitigation (6) or additional future negative emissions. It is not well understood by policy-makers, or indeed many academics, that IAMs assume such a massive deployment of negative-emission technologies. Yet when it comes to the more stringent Paris obligations, studies suggest that it is impossible to reach 1.5°C with a 50% chance without significant negative emissions (3). Even for 2°C, very few scenarios have explored mitigation without negative emissions (2). Negative emissions are also prevalent in scenarios for higher stabilization targets (7). 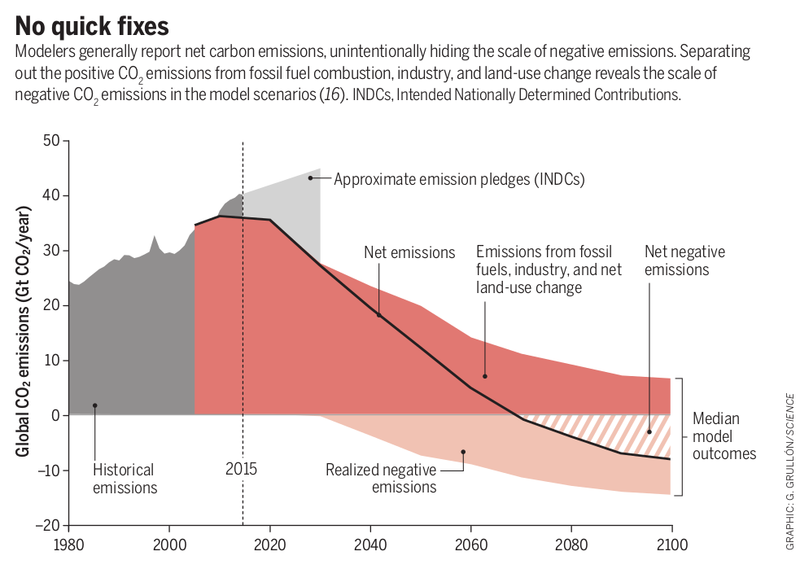 Given such a pervasive and pivotal role of negative emissions in mitigation scenarios, their almost complete absence from climate policy discussions is disturbing and needs to be addressed urgently. Negative-emission technologies exist at various levels of development (8–11). Afforestation and reforestation, although not strictly technologies, are already claimed by countries as mitigation measures. Bioenergy, combined with carbon capture and storage (BECCS), is the most prolific negative-emission technology included in IAMs and is used widely in emission scenarios. It has the distinct feature of providing energy while also, in principle (12), removing CO2 from the atmosphere. Assuming that carbon is valued, BECCS can thus provide an economic benefit that may offset, at least in part, the additional costs of using the technology (13). Generally, carbon is assumed to be fully absorbed during biomass growth, captured before or after combustion, and then stored underground indefinitely. Despite the prevalence of BECCS in emission scenarios at a level much higher than afforestation, only one large-scale demonstration plant exists today. Other negative-emission technologies have not moved beyond theoretical studies or small-scale demonstrations. Alternative and adjusted agricultural practices, including biochar, may increase carbon uptake in soils (9). It may also be possible to use direct air capture to remove CO2 from the atmosphere via chemical reactions, with underground storage similar to CCS. Enhancing the natural weathering of minerals (rocks) may increase the amount of carbon stored in soils, land, or oceans. Introduction of biological or chemical catalysts may increase carbon uptake by the ocean. New technologies, designs, and refinements may emerge over time. The allure of BECCS and other negative-emission technologies stems from their promise of much-reduced political and economic challenges today, compensated by anticipated technological advances tomorrow. Yet there are huge opportunities for near-term, rapid, and deep reductions today at little to modest costs, such as improving energy efficiency, encouraging low-carbon behaviors, and continued deployment of renewable energy technologies. Why, then, is BECCS used so prolifically in emission scenarios? The answer is simple. Integrated assessment models often assume perfect knowledge of future technologies and give less weight to future costs. In effect, they assume that the discounted cost of BECCS in future decades is less than the cost of deep mitigation today. In postponing the need for rapid and immediate mitigation, BECCS licenses the ongoing combustion of fossil fuels while ostensibly fulfilling the Paris commitments. The idea behind BECCS is to combine bioenergy production with CCS, but both face major and perhaps insurmountable obstacles. Two decades of research and pilot plants have struggled to demonstrate the technical and economic viability of power generation with CCS, even when combusting relatively homogeneous fossil fuels (14). Substituting for heterogeneous biomass feedstock adds to the already considerable challenges. Moreover, the scale of biomass assumed in IAMs—typically, one to two times the area of India—raises profound questions (10) about carbon neutrality, land availability, competition with food production, and competing demands for bioenergy from the transport, heating, and industrial sectors. The logistics of collating and transporting vast quantities of bioenergy—equivalent to up to half of the total global primary energy consumption—is seldom addressed. Some studies suggest that BECCS pathways are feasible, at least locally (15), but globally there are substantial limitations (10). BECCS thus remains a highly speculative technology. Although BECCS, like all negative-emission technologies, is subject to scientific and political uncertainties, it dominates the scenario landscape. Yet, as recognition of the ubiquitous role of BECCS in mitigation scenarios has grown, so have concerns about its deployment (10, 11). Its land-use impacts could include terrestrial species losses equivalent to, at least, a 2.8°C temperature rise (11), leading to difficult trade-offs between biodiversity loss and temperature rise. There is also little robust analysis of the trade-offs between large-scale deployment of BECCS (and all negative-emission technologies) and the Sustainable Development Goals (SDGs). But such a level of caution is far removed from the technical utopia informing IAMs. Despite BECCS continuing to stumble through its infancy, many scenarios assessed by the IPCC propose its mature and large-scale rollout as soon as 2030 (see the figure). The appropriateness or otherwise of relying, in significant part, on negative-emission technologies to realize the Paris commitments is an issue of risk (7). However, the distribution of this risk is highly inequitable. If negative-emission technologies fail to deliver at the scale enshrined in many IAMs, their failure will be felt most by low-emitting communities that are geographically and financially vulnerable to a rapidly changing climate. The promise of future and cost-optimal negative-emission technologies is more politically appealing than the prospect of developing policies to deliver rapid and deep mitigation now. If negative-emission technologies do indeed follow the idealized, rapid, and successful deployment assumed in the models, then any reduction in near-term mitigation caused by the appeal of negative emissions will likely lead to only a small and temporary overshoot of the Paris temperature goals (3). In stark contrast, if the many reservations increasingly voiced about negative-emission technologies (particularly BECCS) turn out to be valid, the weakening of near-term mitigation and the failure of future negative-emission technologies will be a prelude to rapid temperature rises reminiscent of the 4°C “business as usual” pathway feared before the Paris Agreement (5). Negative-emission technologies are not an insurance policy, but rather an unjust and high-stakes gamble. There is a real risk they will be unable to deliver on the scale of their promise. If the emphasis on equity and risk aversion embodied in the Paris Agreement are to have traction, negative-emission technologies should not form the basis of the mitigation agenda. This is not to say that they should be abandoned (14, 15). They could very reasonably be the subject of research, development, and potentially deployment, but the mitigation agenda should proceed on the premise that they will not work at scale. The implications of failing to do otherwise are a moral hazard par excellence. 1. J. Rogelj et al., Nat. Clim. Change 6, 245 (2016). 2. L. Clarke et al., in Climate Change 2014: Mitigation of Climate Change. Contribution of Working Group III to the Fifth Assessment Report of the Intergovernmental Panel on Climate Change, O. Edenhofer et al., Eds. (Cambridge Univ. Press, Cambridge/New York, 2014), pp. 413–510. 3. J. Rogelj et al., Nat. Clim. Change 5, 519 (2015). 4. H. J. Buck, Clim. Change 10.1007/s10484-016-1770-6 (2016). 5. J. Rogelj et al., Nature 534, 631 (2016). 6. K. Anderson, Nat. Geosci. 8, 898 (2015). 7. S. Fuss et al., Nat. Clim. Change 4, 850 (2014). 8. M. Tavoni, R. Socolow, Clim. Change 118, 1 (2013). 9. P. Smith, Glob. Change Biol. 22, 1315 (2016). 10. P. Smith et al., Nat. Clim. Change 6, 42 (2015). 11. P. Williamson, Nature 530, 153 (2016). 12. A. Gilbert, B. K. Sovacool, Nat. Clim. Change 5, 495 (2015). 13. D. L. Sanchez et al., Nat. Clim. Change 5, 230 (2015). 14. D. M. Reiner, Nat. Energy 1, 15011 (2016). 15. D. L. Sanchez, D. M. Kammen, Nat. Energy 1, 15002 (2016). 16. The figure shows the median of the 76 IPCC scenarios that limit the global temperature rise to 2°C with 66% likelihood (2). Realized negative emissions are estimated by converting the BECCS energy consumption [exajoules (EJ) per year], assuming an average biomass emission factor of 100 metric tons of CO 2 per terajoule (TJ) and assuming that 90% of the CO 2 is captured. The emission pledges (INDCs) in 2030 are estimated based on cumulative emissions from 2011 to 2030 (5).